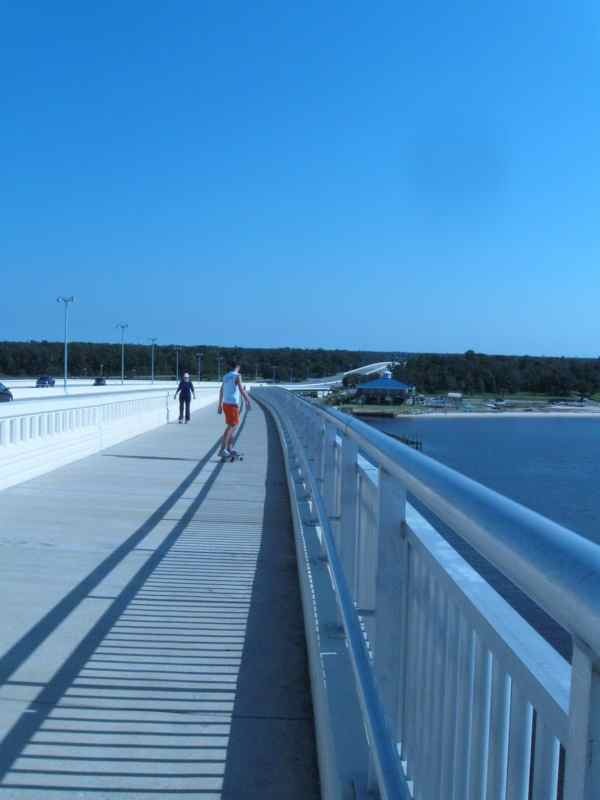 This morning was an exhilarating bridge walk with walking buddy Pat. She and one of her regular walking companions made the bridge’s entire length and back yesterday, more than three miles. In contrast, I am definitely an irregular walking buddy, although my gait does continue to improve. Today Pat matched her pace to my progress, much slower than her normal speed. At the 0.3-mile marker we celebrated the pushing of my bridge-walking distance one-tenth mile farther than any of my previous bridge walks. I did experience a bit of the bridge blues--literally. The sun was so bright, I couldn’t maneuver enough shadow so that I could see the screen on my little camera. I didn’t successfully change from the setting for incandescent lighting that I had used indoors the day before. All my photos were similar to the one above, blue, blue, blue. I tinkered with the other photos in this post. I need these “doctored” photos to help me remember the joy of this day. 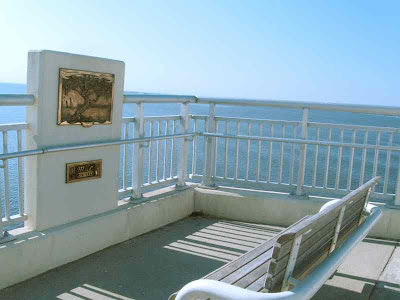 The plaque at the 0.3-mile marker features the live oak, a Gulf Coast icon. The blues didn’t stand a chance. At the 0.3-mile marker was the first of several benches set into alcoves along the walking lane. We sat, rested a bit, and from our lofty perch relished the blue sky, water, shorebirds in flight and the perfect temperature. 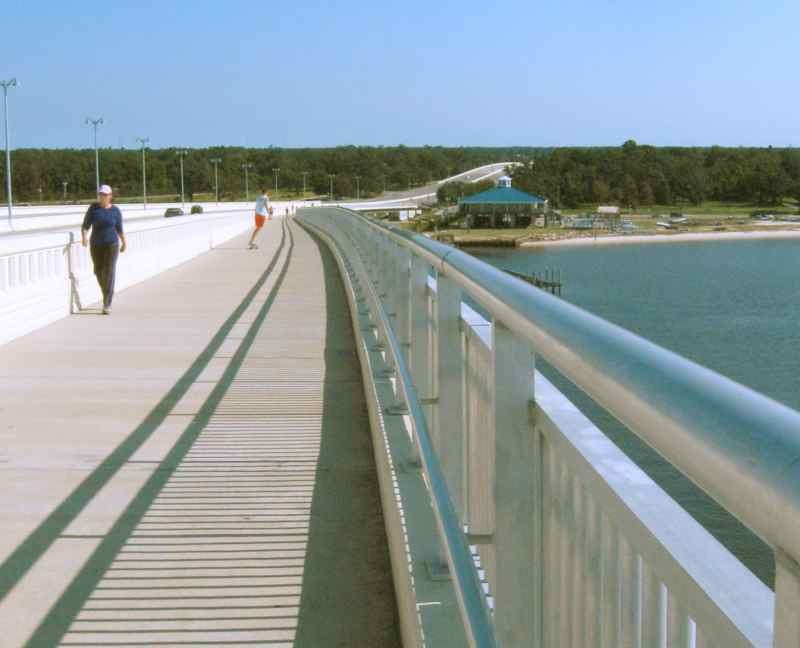 There was also the satisfaction of physical activity shared with others who were also enjoying a morning outing on the bridge. 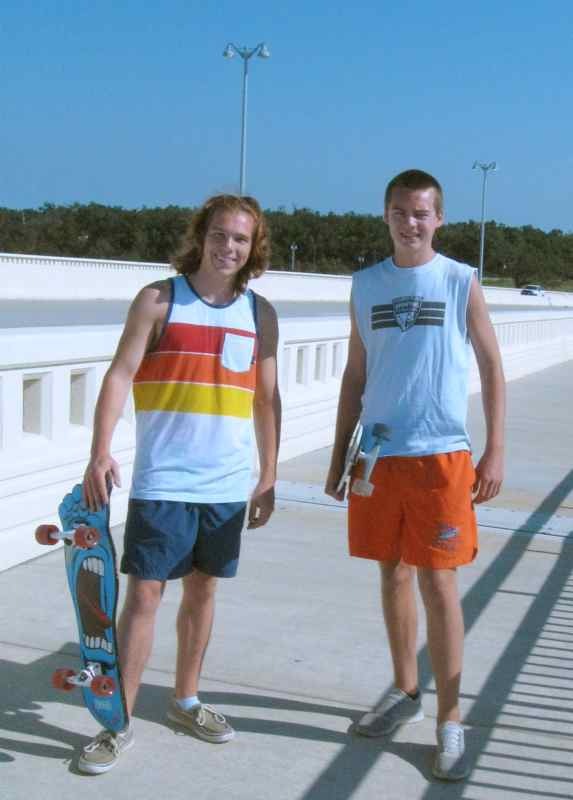 Ian and his skateboard caught our attention. Nick, left, and Ian return for another trip down the bridge. I am thankful for this enjoyable morning and for the friends and strangers who helped put it over the top for this stroke survivor! Beautiful pictures in spite of the sun problems with your camera. While I was in Oregon, I was trying to take pictures of my granddaughter with my phone. However, the combination of the sun, my eyes just after my eye surgery, and my phone's ability to turn the picture around caused me to have close ups of my squinting wrinkled face instead of my gorgeous grandchild. a wonderful morning and i like the blue. 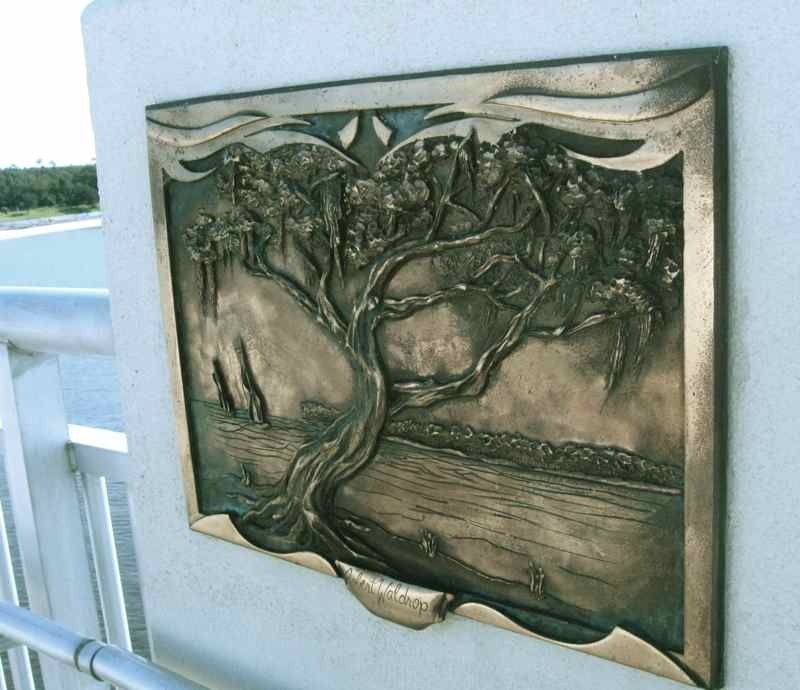 that plaque of the tree is so beautiful and congrats on walking that bridge. 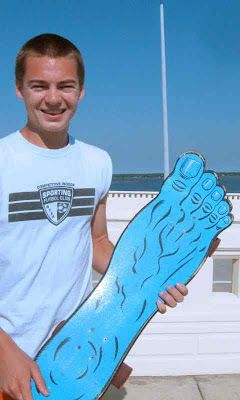 odd looking skateboard and nice look kids. I have to laugh at Marcia, and this reminds me to make sure I adjust the camera indoors while I am in CA next month. One thing about skate boards: They make a lot of noise. Nice photos, though! I love how there are benchmark along the way for you. Progress is wonderful and to do it surrounded by BLUE. Love that fellows skateboard. Good capture. Marcia, your experience with phone and photo technology cracked me up. Sounded like a Linda moment. Dianne, skateboards are not in my future, but they were never in my past either. Physical coordination has never been a characteristic I possessed. That doesn't keep me from enjoying the skills I see when I occasionally catch skateboarding or snowboarding competitions on TV.